Back in in the day, an activist colleague of mine liked to wisecrack that whenever corporations talked about environmental solutions everyone could live with, what they meant were “solutions” only a politically acceptable number of people would die from. That is so 1980s! Sure, some businesses haven’t changed; they’re still trashing the planet, wreaking havoc on the climate and endangering our health with toxic chemicals. But those tired old assumptions that pollution is the inevitable price of progress, or that we have to choose between good jobs and a healthy environment, are increasingly outdated. 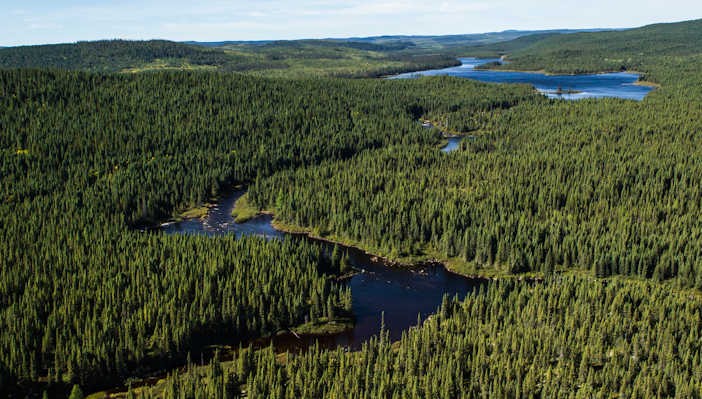 Intact boreal forest, Canada. Photo courtesy Boreal Forest Facts. As (some) businesses have gotten more serious about solutions, those of us working to protect the environment are realizing that they can be – and often are – a partner in progress. But more and more forward-thinking companies realize they can be environmentally and socially responsible and still make money. They’re staking their futures (and the planet’s) on new technologies, new models for their relationships with workers and their communities, and new ways of defining success. For example, the Biomimicry movement is leading companies seeking innovative and sustainable products to look for designs inspired by nature, “the greatest invention machine in the universe.” Companies in industries from beer to cleaning supplies have formed the Zero Waste Business Council, knowing that eliminating waste saves money and increases operating efficiency while reducing pollution and greenhouse gas emissions. A startup called Phonebloks is working with Motorola to design and manufacture a mobile phone with interchangeable parts, eliminating the need to replace the entire phone if one feature breaks. Recognizing that their success depends on their workers’ well-being, more and more businesses – Ben & Jerry’s, Trader Joe’s, Costco and others – are committing to paying a living wage – how much workers need to provide an adequate amount of food, clothing and shelter in the place they live and work. In the UK, there’s even an association of living wage employers, including such brands as Barclays Bank and KPMG business consultants. Others are not just paying their workers fairly but are sharing profits with their communities, through programs like 1% for the Planet. 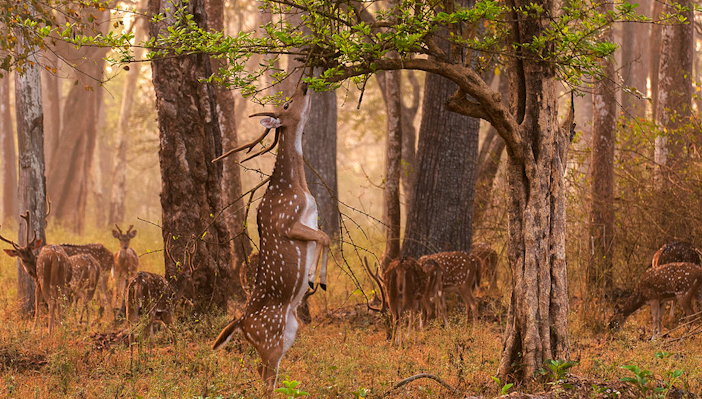 Chital stag browses in Nagarhole National Park, India. Photo by Yathin Krishnappa. Like Patagonia, a growing number of companies are redefining just what it means to be a successful business and who gets to share in that success. Feeling limited by conventional structures and cultures that prioritize short-term profits over values like a healthy environment and happy workers, almost a thousand corporations in 32 counties have joined B Corp, which certifies companies to meet rigorous standards of social and environmental performance, accountability and transparency. Don’t get me wrong. I’m not about to cozy up to Exxon Mobil, Dow Chemical or Monsanto. As Bill McKibben says, they’re clinging to business models that are fundamentally at odds with the continued survival of life on this planet. Strong and unrelenting pressure – campaigns, protests, boycotts and legislation – must still be directed against them until they change. (And as the success of corporate and marketplace campaigns by organizations such as Rainforest Action Network or Corporate Accountability International shows, those tactics still work). 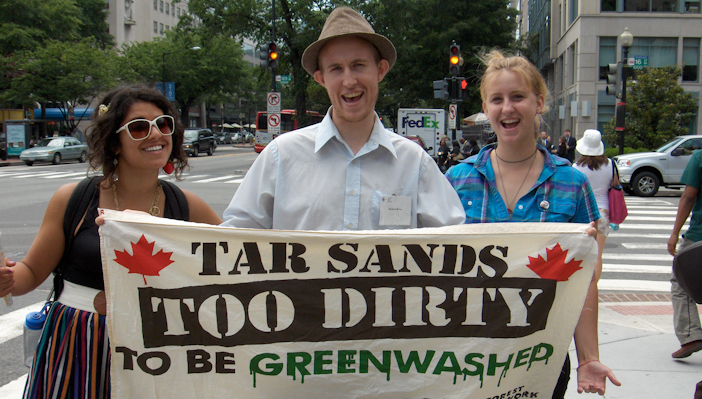 Representatives of the Rainforest Action Network Canada protest a forum on energy and environment sponsored by ExxonMobil. But the trend is clear: Visionary companies that plan to stay in business are investing in a sustainable future. They know that the only way not to be part of the problem is to be part of the solution. They aren’t 100% there yet, but a good number are on the journey. Stay tuned and in the next instalment, we’ll share strategies and actions that each of us can do to further support real solutions among our businesses today. Read more of Annie Leonard’s Solutions Series on Patagonia’s Cleanest Line blog.